I find a ton of inspiration in the world of yoga podcasts. I love walking and listening and being totally immersed in someone else's conversation. I love stories, and there are so many interesting ones out there to be shared, heard and learned from. Thanks to some really great podcasts I get to virtually meet some really interesting personalities; hear some really intriguing stories; and grow even more as a yoga student and teacher. I do subscribe to a lot of podcasts in general. While some of my long-term favourites are Swedish entertainment or interview podcasts, over the past year I've been researching the Yoga podcast scene. I've been trying dozens and dozens of them, in the London tube, when walking up and down the hills of San Fransisco, on planes over the atlantic ocean and lately, as I walk around Dublin town. Today I'd like to share my absolute favourite ones with you, what they are about and why they are my favourites. In his weekly show, Lucas interviews yogis, fitness instructors and health entrepreneurs. I love how the conversation always stays fresh and interesting. So how does he do it? Lucas is the founder of Absolute Yoga Academy which is one of the world's top yoga teacher training schools. He is American but based in Barcelona which might work to his advantage with gaining some real fresh perspectives. Lucas is a great listener and has a very nice voice. And that's definitely important. One of my favourite parts of the show is the Q&A at the end of each episode. This is when Lucas, that is also a chef, comments upon common food myths and gives his advise for a better health and eating habits. "What if we could exercise less and move more, so that we can feel better?" This is the question that Jen poses at the beginning of each episode. It sets the tone for further discussions on how we can incorporate more movement into our lives, the power of our minds, our relationships and healthy actions. Jen gets her message across; change doesn't have to be hard. The only thing we need to do is to incorporate small changes in our everyday lives, and eventually great results will come. The episodes are short and sweet, but fortunately - there's a new one every week. This is definitely one of my favourite podcasts out there. With one new guest each month, Hunter lets you discover their personal story in a way that is genuine, enjoyable and interesting. Her guests are yogis, or yoginis as she calls them, and Hunter does select her guests carefully, each one of them has a fascinating story to tell. Through her episodes you learn about a range of interesting subjects; including yoga for fertility, yoga after an injury and yoga for mindfulness. Breakfast. It can be so many things and I believe for most of us it tends to change; we vary it depending on the time, the season and whether we are out or at home. When I was growing up we had sourcream yoghurt (filmjölk) with homemade cassis jam and granola for breakfast. I can't say I really liked it. The filmjölk per se is sour and the cassis jam was hardly sweet enough for my immature taste. My biggest cheer was on the weekend when we, if I was lucky, ate some honey yoghurt or in summer when we had fresh raw strawberry jam in the refridgerator. When I was a teenager I loved making pancakes or scones for breakfast, or if I was in a rush I often just grabbed a couple of apples. Since then, fortunately, I have found quite a few morning foods that power me up for a great day. 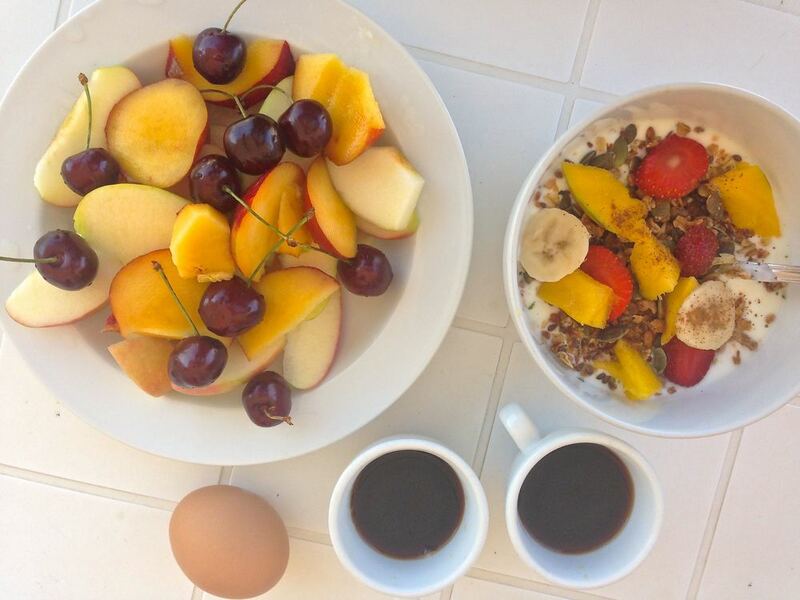 For me black coffee and fruit is an essential in the morning. Without it, I don't feel quite like myself. Mix all ingredients in a bowl. Stir gently and refridgerate overnight. Place some fresh or frozen raspberries in a glass and pour the chia oat mixture on top and decorate with goji berries, cacao nibs and sprinkle with cinnamon. When me and Damien have breakfast in a café I often bring a protein bar to have alongside my coffee. Then it is just a bonus if I find something that I like, such as these dried pineapple rings. Hope you found some inspiration, expect a follow up post soon!